Java Runtime Environment (JRE) makes Internet and applications dynamic and closer to the users. Java Runtime Environment (JRE) is a Java virtual machine. It is a part of Java Runtime SDK but without the development tools such as compilers and debuggers phase. 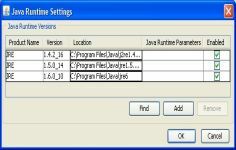 Java is compiled with the Java plug-in software that allows to use JRE widely deployed Web browsers to run applets. Many applications locally and on the internet designed in Java need a runtime environment (or Virtual Machine) Java for use on Windows, Mac and Linux. If you need "Java" on your computer, download directly Clubic the Java Runtime Environment also called JRE, Java Virtual Machine, Java Virtual Machine or JVM. Close your applications and browsers and start the installation. Once the process is complete reboot your machine. JDK 8u201 contains IANA time zone data version 2018e. For more information, refer to Timezone Data Versions in the JRE Software. The TLS anon (anonymous) and NULL cipher suites have been added to the jdk.tls.disabledAlgorithms security property and are now disabled by default. The jarsigner tool now shows more information about the lifetime of a timestamped JAR. New warning and error messages are displayed when a timestamp has expired or is expiring within one year. The expiration date for 8u201 is April 16, 2019. Java expires whenever a new release with security vulnerability fixes becomes available. For systems unable to reach the Oracle Servers, a secondary mechanism expires this JRE (version 8u201) on May 16, 2019. After either condition is met (new release becoming available or expiration date reached), the JRE will provide additional warnings and reminders to users to update to the newer version. This release contains fixes for security vulnerabilities described in the Oracle Java SE Critical Patch Update Advisory. For a more complete list of the bug fixes included in this release, see the JDK 8u201 Bug Fixes page.